The NC Potato Festival is a fun-filled, family festival that celebrates one of Northeast North Carolina’s largest crops — Potatoes. 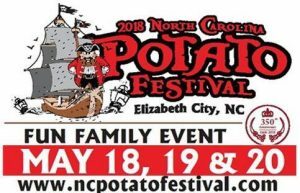 Make a weekend of it and come and join us on the corner of Main and Water Streets in Elizabeth City. Three days of fun, food and entertainment!